In previous articles I have dealt in detail with issues involving magnesium1 and strontium2 in reef aquaria. While information on the amount of strontium and magnesium delivered by calcium carbonate/carbon dioxide reactors has been previously shown, similar information has been unavailable for limewater. This article gives experimental data on the amount of magnesium and strontium present in one commercial source of calcium oxide (Mississippi Lime Company; Figure 1) that many aquarists have found to be an inexpensive source of high quality lime (although it must be bought in very large lots from distributors). It also shows how those ions might or might not actually make it into the water column of reef aquaria, and compares the amount of these ions delivered by limewater to the amount used by corals in depositing their skeletons. Because of a potential imbalance between the amount of magnesium and strontium used by corals, and the amount delivered by limewater, using limewater can potentially lead to depletion of both ions in aquaria. In the past, there has been significant discussion of the depletion of magnesium by limewater. Craig Bingman3 showed that precipitation of magnesium carbonate and hydroxide in aquaria using limewater was not very likely to be significant. More likely, such depletion is simply the result of not delivering as much magnesium to the aquarium as is being “exported” during calcification. This article shows how this depletion might work for both magnesium and strontium. How Much Magnesium Do Corals Consume? The amount of magnesium incorporated into the skeletons of various calcifying organisms varies considerably. In a previous article,1 I showed that corals in the ocean can incorporate between about 0.1% and 3.5% by weight magnesium in their skeletons. Coralline algae also incorporate a considerable amount, typically more than 1%, and as high as 4.4% by weight. There are few data on coral skeletons in aquaria, but the magnesium content is not expected to be significantly different from this range. Calcium is present in these skeletons at about 35-38% by weight, since they are largely calcium carbonate. Consequently, the Mg/Ca ratio ranges from about 0.0025 to 0.12 by weight (on a mole basis, these Mg/Ca ratios are about 0.004 to 0.2; all subsequent Mg/Ca ratios in this article are by weight). Consequently, if one wanted a calcium supplement to be the sole source of magnesium in an aquarium, then it would have to include approximately this same Mg/Ca ratio (0.0025 to 0.12) to preclude building up or depleting magnesium over time. Obviously, with such a wide range, the exact balance in any given aquaria will be determined in part by the mix of corals and coralline algae being maintained. Fortunately, there is such a large reservoir of magnesium in seawater that it takes large differences between import and export to cause important changes in magnesium levels. Figure 1. 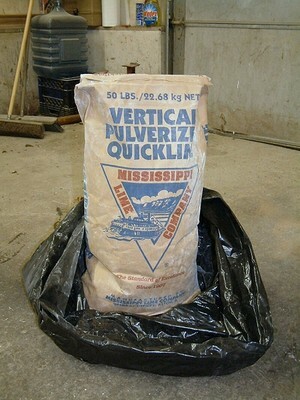 A bag of quicklime in the garage of David Guimond. How Much Strontium Do Corals Consume? The amount of strontium incorporated into the skeletons of various calcifying organisms does not appear to vary as much as magnesium. In a previous article,2 I showed that corals typically incorporate about 0.9% by weight strontium in their skeletons. Calcium is present in these skeletons at about 35-38% by weight, since they are largely calcium carbonate. Consequently, the Sr/Ca ratio is about 0.02 by weight (this Sr/Ca ratio is about 0.01 on a mole basis; all subsequent Sr/Ca ratios in this article are by weight). Consequently, if one wanted a calcium supplement to be the sole source of strontium in an aquarium, then it would have to include approximately this same Sr/Ca ratio (0.02) to preclude building up or depleting strontium over time. Unlike magnesium, there is not much strontium present in seawater. Consequently, it does not take a large imbalance between import and export to significantly skew strontium levels in aquaria. Limewater4,5 (also known by the German term kalkwasser) has been used very successfully by aquarists for a number of years, and it is the system that I use on my reef aquarium. It is comprised of an aqueous solution of calcium and hydroxide ions that can be made by dissolving either quicklime (calcium oxide, CaO) or lime (calcium hydroxide, Ca(OH)2). The only inherent difference between the two is that if you add a molecule of water to quicklime, you get lime, and that a great quantity of heat can be generated when that happens. Consequently, hydrating and dissolving quicklime can make water quite warm, especially if an excess of solids are added. One aquarist contacted me after he melted his limewater reactor by putting quicklime into it. So understanding the difference between the two forms does have advantages! Once in the tank at an acceptable pH,8 there is no concern that the alkalinity provided by limewater is any different than any other carbonate alkalinity supplement. The hydroxide immediately disappears into the bicarbonate/carbonate system. In other words, the amount of hydroxide present in tank water is really only a function of pH (regardless of what has been added), and at any pH below 9, it is an insignificant factor in alkalinity tests (much less than 0.1 meq/L). Consequently, the fact that alkalinity is initially supplied as hydroxide in not to be viewed as problematic, except as it impacts pH (see below). Consequently, limewater is most often added slowly, by dripping or slow pumping. Often it is added as the top off water, replacing most or all of the evaporated water. The pumps add cost and complexity to the system, especially if combined with a float valve or switch (I use the latter and a Reef Filler pump). It also turns out that magnesium is very insoluble at high pH. In limewater, its low solubility can result in precipitation of magnesium hydroxide on the bottom of a limewater reservoir. This precipitation limits how much of the magnesium in the lime is delivered to aquaria, as will be shown below. The calcium oxide that I use from the Mississippi Lime Company is food grade (Figure 1). The company lists a number of impurities in it, but does not break out magnesium and strontium. Table 1 shows a typical analysis supplied by the manufacturer. Table 2 shows the required limits to food grade CaO. High calcium quicklime –derived from limestone containing 0 to 5 percent magnesium carbonate. Magnesian quicklime–derived from limestone containing 5 to 35 percent magnesium carbonate. Dolomitic quicklime–derived from limestone containing 35 to 46 percent magnesium carbonate. High calcium hydrated lime–high calcium quicklime produces a hydrated lime containing generally 72 to 74 percent calcium oxide and 23 to 24 percent chemically combined water. Dolomitic hydrated lime (normal)–under atmospheric hydrating conditions only the calcium oxide fraction of dolomitic quicklime hydrates, producing a hydrated lime of the following chemical composition: 46 to 48 percent calcium oxide, 33 to 34 percent magnesium oxide, and 15 to 17 percent chemically combined water. There is no information provided by either the Mississippi Lime Company, or the National Lime Association on the amount of strontium in any of these products. Experimental Results: What Is Present In Quicklime? In order to better assess how much strontium and magnesium would be delivered by the use of this brand of lime, I determined how much calcium, magnesium, and strontium were present using Inductively Coupled Plasma-Optical Emission Spectroscopy (ICP-OES). Details of the method are given at the end of the article for those who may want to reproduce it on other materials. The results are shown in Table 3. Table 3. Alkaline Earth Metals In Quicklime. As expected, the primary ingredient is calcium. Magnesium is fairly low, and strontium is quite low. This material has a Mg/Ca ratio of 0.0038. That is at the low end of the Mg/Ca ratio found in corals, and well below that found in coralline algae. It has a Sr/Ca ratio of 0.00037. That Sr/Ca value is far below the 0.02 ratio for Sr/Ca found in typical corals. Experimental results: what is present in limewater? I dose my aquarium with limewater made from the quicklime tested in the previous section. I typically use limewater at less than saturation because my reef aquarium does not need full strength limewater. In order to test for magnesium and strontium in the limewater that I dose, I made 44 gallons of limewater, and dosed it for about 3 weeks. I then took a sample of the clear limewater that remained. It had a conductivity of 7 mS/cm, indicating that it is not saturated (saturated limewater usually has a conductivity of about 10.3 mS/cm).14 This sample was analyzed as is, and the results are shown in Table 4. Table 4. Alkaline earth metals in limewater. It is interesting to note that relative to calcium, magnesium is greatly underrepresented compared to that in the starting quicklime. The reason for this result is the well known insolubility of magnesium hydroxide. Any magnesium ions released into the solution rapidly combine with hydroxide to form insoluble magnesium hydroxide that precipitates. In a previous article on the solubility of metals in limewater,13 I showed a graph of the theoretical solubility of magnesium as a function of pH (below). At the pH of limewater (low 12’s) the solubility is between 0.01 and 0.001 ppm. The experimental solubility here is a tad higher (0.017 ppm), presumably for one of two reasons: some particulates of magnesium hydroxide may have been present in the solution which are detected as soluble magnesium when in fact, it is not. A second possibility is that the solution has simply not reached thermodynamic equilibrium, and the theoretical limit to solubility has not yet been reached.. Nevertheless, the point is that it is expected that magnesium hydroxide will precipitate from such a solution, and this did, in fact, happen. The magnesium in solution was depleted by a factor of more than a hundred compared to what would have been in solution had it all been soluble. In the next section of this article, the precipitate on the bottom of the limewater reservoir was tested to show this extra magnesium. Relative to calcium, strontium was nearly unchanged in the limewater compared to the solid quicklime. The slight elevation in the limewater is above the background noise, however, since the emission signal from strontium is so strong. The reason for this slight elevation is that strontium is even less likely than calcium to precipitate onto the bottom of the limewater reservoir, and so stays more in solution than calcium. Experimental Results: What Is Present In Limewater Sludge? The solids on the bottom of a limewater reservoir contain everything that did not dissolve, or that dissolved and later precipitated from solution. Such solids could contain magnesium hydroxide and carbonate, calcium hydroxide and carbonate (though calcium hydroxide is fairly unlikely in unsaturated limewater) and a variety of other impurities, such as alumina, silica, etc. In order to determine what was in it, a sample of the white solids was taken from my limewater reservoir where it had been collecting for months. It was removed along with some limewater. The mixture of solid and liquid was acidified as was the solid quicklime (but using half as much acid since it was not as concentrated), and the constituents were determined by ICP. The results are shown in Table 5. Only relative concentrations are shown as no effort was made to dry the sample prior to analysis, making absolute concentrations meaningless. Table 5. Alkaline Earth Metals In Limewater Sludge. As anticipated, relative to calcium, magnesium is enriched by a factor of 13 in the sludge compared to the solid quicklime. This magnesium may be present as both magnesium hydroxide and magnesium carbonate, but because magnesium carbonate is fairly soluble compared to calcium carbonate, it is most likely that the primary magnesium salt is magnesium hydroxide. It may also be as mixed calcium and magnesium carbonates. Interestingly, strontium is actually depleted by a factor of 2 relative to solid quicklime, indicating that it is less likely to end up on the bottom of the reservoir than is calcium. While strontium carbonate is somewhat less soluble than calcium carbonate, the strontium concentration in the limewater is so low that SrCO3 may not actually be saturated, so the precipitation is less. The strontium that is there may simply be copreciptiated with calcium carbonate. In order to understand what happens over time to magnesium levels in an aquarium using this quicklime, I have developed some simple mathematical models. In the first model, we examine what effects there are if all of the magnesium in the quicklime enters the aquarium. This might happen, for example, if the quicklime is first fully acidified to pH 7 or less with vinegar (not something that I recommend). It may also happen if you deliver a slurry of quicklime (or cloudy, unsettled limewater) to the aquarium. In this model, no magnesium is assumed to be lost due to any process except calcification, and no magnesium is assumed to be added except that coming from the quicklime. For this model we will assume that magnesium is removed from the aquarium as a coprecipitate with calcium carbonate at an average level of 1% magnesium by weight (a Mg/Ca ratio of about 0.025). An aquarium with a heavy load of organisms that use more magnesium, like coralline algae, may show a larger depletion of magnesium. We also assume that the quicklime is added with 0.25% magnesium by weight (as was determined above). 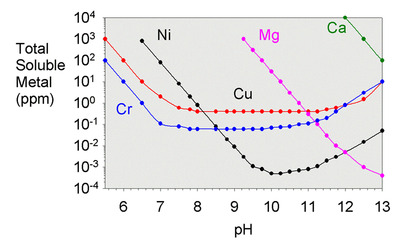 Table 6 shows what happens to magnesium over time when the aquarium is dosed with the equivalent of 0.5, 1, and 2% of the tank volume daily in saturated limewater. Even though the supplement may not be added as saturated limewater, many aquarists can readily relate to percentages of the tank volume in saturated limewater. This is just a unit of measure, and does not indicate exactly how the lime is added. Specifically, the 0.5%, 1%, and 2% levels correspond to 0.6, 1.1, and 2.3 grams of CaO per 100 liters of tank volume per day, respectively. Table 6. Magnesium Depletion With Delivery Of All Magnesium In Solid Quicklime. In a second model, instead of delivering everything in the quicklime, we look at adding just what is present in clear, settled limewater. From the tests above, it contains 0.017 ppm magnesium. Since magnesium is depleted from the settled limewater, we anticipate that the magnesium depletion in the aquarium will be even more significant. The results are shown in Table 7. Table 7. Magnesium depletion with dosing of settled limewater. As expected, the magnesium depletion is faster when dosing the settled limewater. The difference is not all that great, however, because both the solid quicklime and the settled limewater are significantly deficient in magnesium (relative to typical corals and coralline algae). The same model can be applied to understand what happens over time to strontium levels in an aquarium using this quicklime. In the case of strontium, it does not matter if one lets the limewater settle or not because the strontium itself does not appreciably settle. As in the magnesium model, no strontium is assumed to be lost due to any process except calcification, and no strontium is assumed to be added except that coming from the quicklime. For this model we will assume that strontium is removed from the aquarium as a coprecipitate with calcium carbonate at an average level of 0.9% strontium by weight. Table 8. Strontium Depletion Using Quicklime Or Settled Limewater. From these results, it is obvious that the potential for strontium depletion is significant. Strontium has not, however, been so extensively depleted in my aquarium using this material. Perhaps water changes have made all the difference. Or perhaps there are other processes that impact import or export of strontium. Nevertheless, the potential for strontium depletion seems obvious. In previous articles, I have used published data to show how magnesium1 and strontium2 might become depleted over time in aquaria using calcium carbonate/carbon dioxide reactors. Table 9 shows the relative concentrations of calcium, magnesium, and strontium in these different systems. From this table, it is clear that limewater is not alone in delivering too little strontium, with the commercial reactor media being similarly deficient. The reactor media are better at delivering magnesium than settled limewater, since the lime starts out about the same as the reactor media, but then looses its magnesium to precipitation. Many aquarists, myself included, have used quicklime from the Mississippi Lime Company to supplement calcium and alkalinity. I have been using it for several years, and know aquarists that have been using it much longer than that. Using such a material, however, has the potential to deplete both magnesium and strontium over time. The effect is especially pronounced for strontium. The depletion mechanism is simple: the dosed limewater simply adds less magnesium and far less strontium than corals in the ocean normally deposit. No unusual precipitation reactions are necessary for the aquarium to become depleted. In fact, the same depletion mechanisms take place for aquarists using CaCO3/CO2 reactors and any of several commercial CaCO3 media. Whether these ions actually become depleted in aquaria will depend on many factors, such as the use of regular water changes, the import of such ions in other ways, and whether corals and coralline algae (and abiotic precipitation) use up strontium and magnesium to the same extent that they do in the ocean. I am nevertheless surprised that the strontium in my aquarium (about 15 ppm)2 is about the same as in the Instant Ocean salt mix that I use, and does not appear to be significantly depleted. The results obtained in this study apply only to the particular brand of bulk lime tested. It is not known if any of the commercial aquarium supply companies use this bulk material, or its hydrated form, to make their “kalkwasser” products. The results on settled limewater involving magnesium will likely extrapolate to all brands, as the precipitation of magnesium will be largely independent of how much magnesium is present to begin with. Strontium, however, could vary significantly. Nevertheless, these results suggest that aquarists using limewater, as well as those using CaCO3/CO2 reactors, should be aware of the fact that both strontium and magnesium may become depleted over time. Thee different wavelengths have different emission intensities. In some cases, the signal was too strong, and samples were diluted, or that emission wavelength was simply not used for that ion in that sample. ICP-OES is so sensitive to these ions that even the pure (18 MW) laboratory deionized water showed clear emission peaks from these ions at the most sensitive wavelengths. None of the samples were filtered, but all looked visibly clear.. The quicklime sample was made suspending 1 g of quicklime (Mississippi Lime Co. Vertical Calcium Oxide: CODEX (Food Grade) Pulverized Quicklime; Figure 1) in 1 L of deionized water. The sludge sample was prepared using 2.9 g of sludge (a mixture of water and solids) in 1 L of deionized water. The solid quicklime and sludge samples were acidified to pH 2 using reagent grade concentrated hydrochloric acid to be sure it all dissolved. Quantitation involved comparison of emission intensity to standards made from calcium sulfate and magnesium sulfate, and a commercial strontium standard (50 ppm) supplied by Varian. Calcium standards were 294, 29.4 and 2.94 ppm calcium. Magnesium standards were 98.6, 9.86, and 0.986 ppm magnesium. Strontium standards were 5, 0.5 and 0.05 ppm strontium. The signal from deionized water acidified with the same amount of acid was subtracted from those samples that required acidification (that is, the solid quicklime and sludge samples). This subtraction turned out to be insignificant for magnesium, but was significant for strontium. ICP-OES is a very sensitive technique for these ions, and a real signal could easily be detected for all three, even in the pure (18 MW) laboratory deionized water. Limits To Limewater, by Craig Bingman Aquarium Frontiers, January/February 1997.